So what makes a good tomato relish? Fresh tomatoes (as opposed to tinned) are an excellent start, and if possible, organic tomatoes will improve your relish by a good deal more. It goes without saying to use onion and garlic. And seeds and spices add their own tributes. Fennel seeds are a favourite of mine. The aniseed taste is perfect with tomato as is cinnamon and all spice. 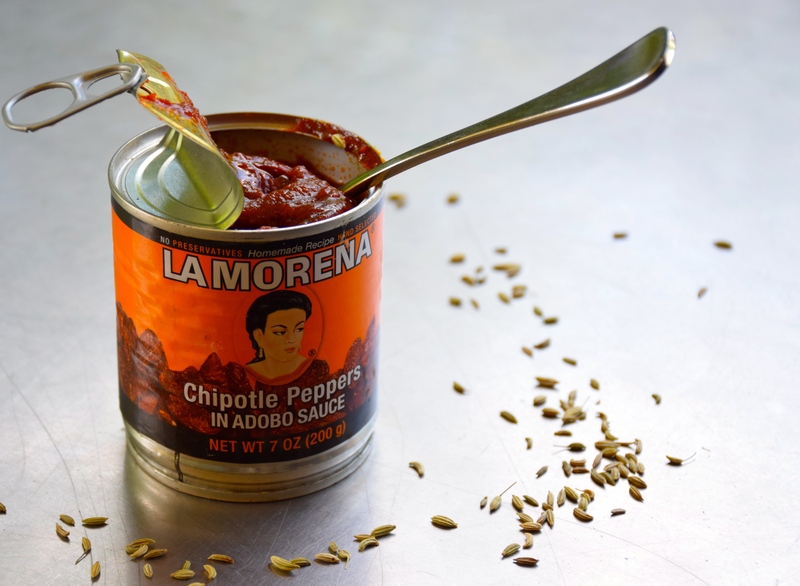 This is the part in the post where I tell you how much I love chipotle peppers in adobo sauce. Are you a fan? I’m mad for their flavour. Chipotle peppers are ripe Jalapeños that are dried and smoked, the adobo part is the sauce they come in. The sauce should be used too, it’s packed with the same smoky rich taste. I’ve continuously kept a can in the pantry ever since I discovered I could buy them at my local butcher. Since then I’m seeing them available in more and more stores. Good green grocers are now stocking them and most delicatessens have them too. When I have a jar of this hand made relish in the fridge, I know straight off the bat I can jazz up any type of sandwich. Be it the toasted or the fresh, or on a fried egg roll. I can spread it on a pizza base and have a hot lunch in no time with the help from just a few olives, feta and grated zucchini. Or, I can add a spoonful or two to a soup or a stew. To lift its origins. What about added to dipping sauce? Use either mayonnaise or yoghurt with just a few spoons of relish mixed through it to eat with anything deep fried – especially these smoked trout croquettes. Be sure the efforts of making this relish are worth while – guaranteed to help lessen the ‘staring into the fridge declaring there’s nothing to eat’ scenarios. Heat 2 tbsp oil in a large heavy based saucepan. Add onions, garlic and fennel seeds, cook on a low heat for 10 minutes. Add the diced tomatoes, spices, chipotle chillies, vinegar, sugar and salt. Bring to the boil, stir regularly. 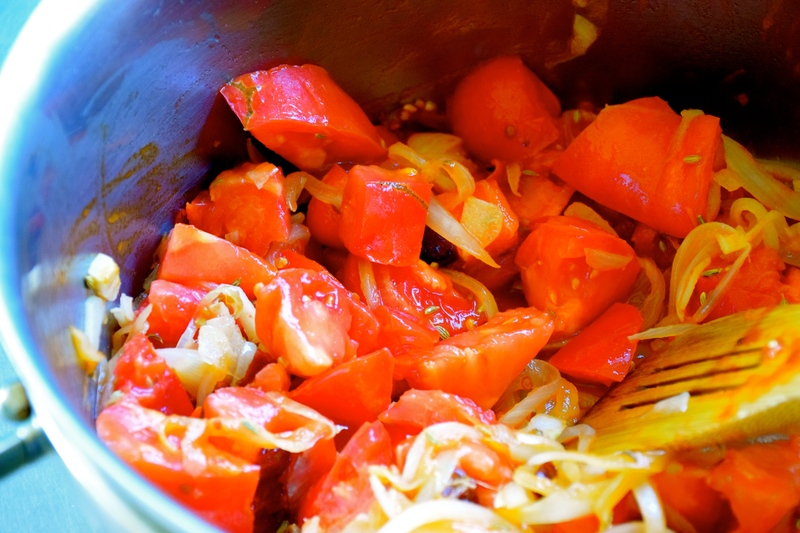 Cook on medium to low heat for 45 minutes to 1 hour, or till the relish is thickened and the water from the tomatoes has reduced away. 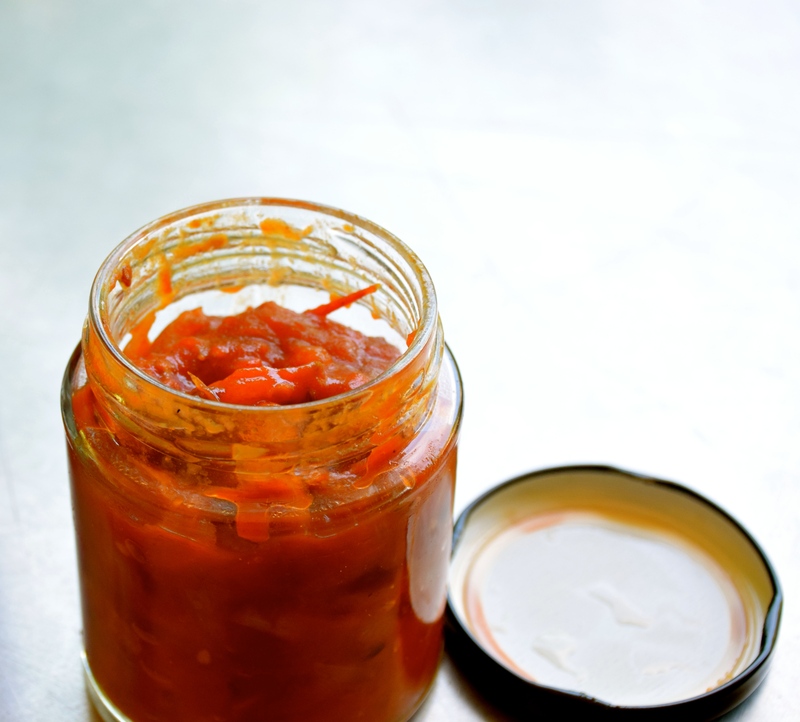 Meanwhile, sterilise 3 – 4 jars – see Tip – and spoon relish in whilst hot. Seal and store in the pantry. Store in the fridge after opening. Pre heat oven to 120C. Place the washed jars, minus any plastic seals in the oven on a tray for 20 minutes, remove and fill jars. Or, Place jars and lids in a tray. Fill the jars and lids with boiling water, stand for several minutes, then, and this is sometimes the awkward part, pour the hot water out without burning yourself, allow jars to steam dry. Fill jars. Very inspiring Michelle! I’m a fridge starer as well, most people probably are. The chutney sounds wonderful and you have made me want to seek out those peppers! Thanks Chez. Find those peppers, they are awesome in any thing Mexican. I’ve got a great chicken mole dish that uses them along with grated chocolate. Might have to post that soon. This relish looks and sounds wonderful. I do buy chipotles in adobo sauce in little tins and all I’ve ever used them for is chipotle hummus. But I’m inspired by this post and all your ideas for using the relish. What a perfect Cinco de Mayo post! I do the same thing with wild garlic pesto, have loads in my fridge to make easy meals. I’ve never actually cooked with chipotles, they’re pretty new to Ireland, this looks like a good place to start..
Wild garlic pesto…that sounds amazing!